The mini-DisplayPort interface is a miniaturized version of the popular DisplayPort digital display interface. The mini-DisplayPort to VGA adapter provides the best sleek compatibility experience as it seamlessly enables interoperability with existing analog projectors and displays. The mini-DisplayPort to VGA adapter is standards compliant with the DisplayPort standard, and also is forward compatible with Thunderbolt.The mini-DisplayPort to VGA adapter allows you to connect to an extended display or work in mirrored mode with VGA projectors, commonly associated with VGA resolutions up to 1920 x 1200 @ 60Hz reduce blanking display resolution, so the same visual information that you see is viewed by your audience. The mini-DisplayPort to VGA adapter is color coordinated to be consistent with the superior ThinkPad experience. The mini-DisplayPort interface is a miniaturized version of the popular DisplayPort digital display interface. 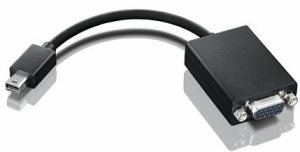 The mini-DisplayPort to VGA adapter provides the best sleek compatibility experience as it seamlessly enables interoperability with existing analog projectors and displays. The mini-DisplayPort to VGA adapter is standards compliant with the DisplayPort standard. The mini-DisplayPort to VGA adapter allows you to connect to an extended display or work in mirrored mode with VGA projectors, so the same visual information that you see is viewed by your audience. The mini-DisplayPort to VGA adapter is color coordinated to be consistent with the superior ThinkPad experience.